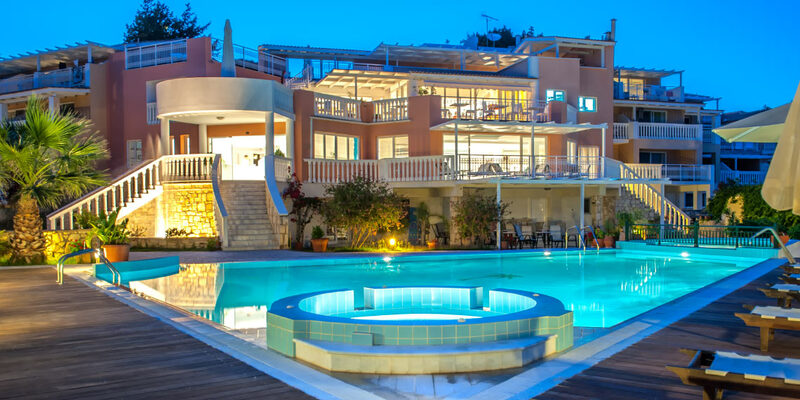 The Belvedere Boutique Hotel is the perfect place for a holiday, located amongst Cypress trees in the beautiful verdant area of Vassilikos; undoubtedly one of the prettiest places on the island of Zakynthos. Vassilikos is a charming village still relatively untouched by tourism, with tavernas and bars set in a friendly and welcoming atmosphere. 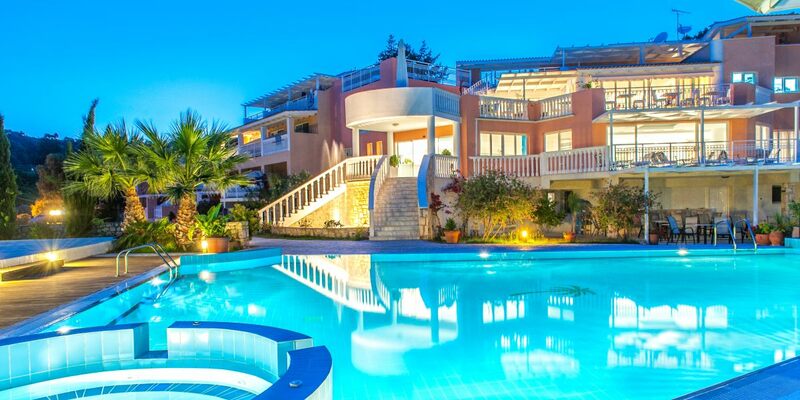 Built on the side of a small hill, it overlooks the green fields below and beyond the blue sea of Gerakas and Porto Roma bays; only a 5 minute walk away. The main colours are white and blue mixed with the green color of the surrounding trees. 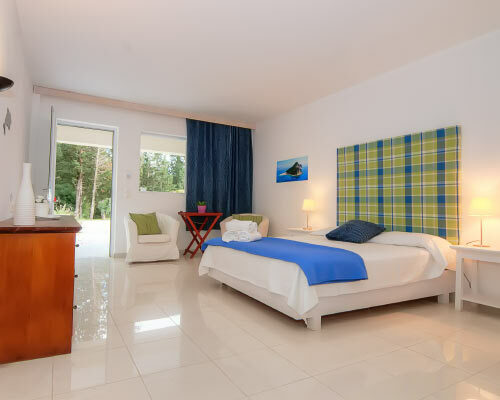 The hotel provides a relaxed and quiet atmosphere as well as internet access, satellite TV and air-conditioning. When I entered the lobby, a sense of serenity and calmness overwhelmed me. The sparkling white with splashes of green and blue created this tranquil mood. Everyone was polite and friendly and the welcome was really strong. The kind girl who escorted us to our room also gave us a quick idea about the hotel and the surrounding area. She opened the door and I went WOW!!! 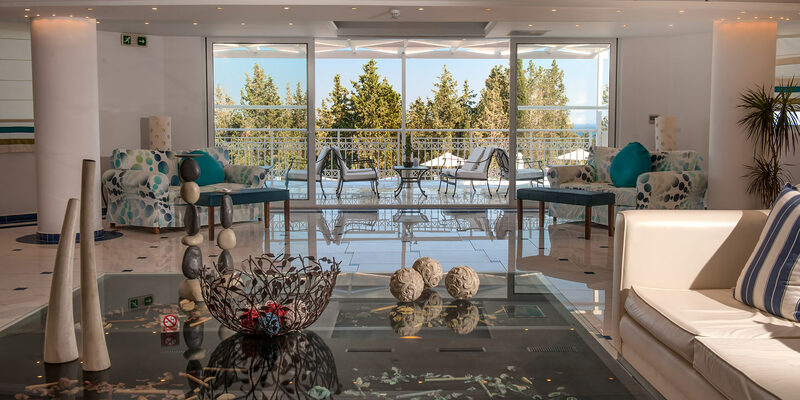 The light coming in from the big balcony doors was so bright and the room looked so spacious, airy, clean and fresh. I went out to the balcony and was amazed by the breathtaking views. So many shades of green spreading down the low hill and the blue colors of the sea were enchanting!! From this first moment, I knew I was going to enjoy this holiday and this I did!!! We enjoyed every single day! In the morning, a game of tennis in the modern tennis court of the hotel and a quick swim in the pool to freshen up before breakfast. There was always something different on the buffet, a cake, a tart, Greek lukumades, pancakes, etc. Everything was fresh and clean and the staff so helpful and always with a smile, you really felt at home. Later on, we were heading for Gerakas beach or any one of the many beaches which we could walk to within 5-20 minutes. Early in the afternoon, we returned to the hotel for a sauna and outdoor Jacuzzi. An experience to remember!! Then, a swim in the pool and a quick snack and drink at the pool bar making jokes with the nice barman. A refreshing shower and nap and we were ready for dinner which we looked so much forward to, as every time there was a surprise waiting for us. The views from our table fantastic, the colors of the sunset over Gerakas bay amazing, the service, the food and the atmosphere excellent! The Belvedere Hotel is proud to introduce a new approach to Eco Friendliness!! Situated within the boundaries of the National Marine Park and surrounded by an unspoilt verdant area, we think that we should add as much as we can to the protection of this beautiful piece of land, so that it will remain unspoilt for us, our guests and the later generations to come. 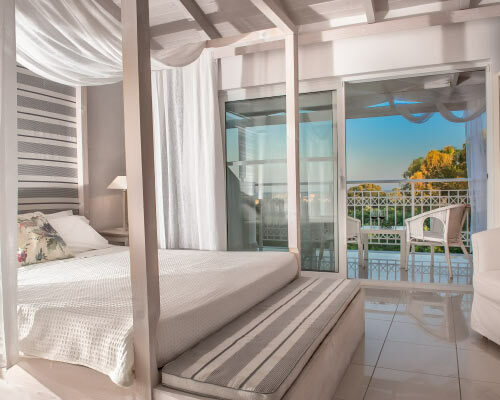 The Junior Suite features a double bed and seating area (2 sofa beds), small kitchen and balcony or terrace with outdoor seating offering beautiful sea views. It can accommodate up to 4 people. The Junior Suite features a double bed and seating area sofa bed, small kitchen and a balcony or terrace with outdoor seating. It can accommodate up to 4 people. The Maisonettes are suitable for 2- 4 people and are built on two floors. On the ground floor there is a living room with a sofa bed suitable for 1-2 children and a kitchenette. Upstairs there is a bedroom with a double bed and bathroom. 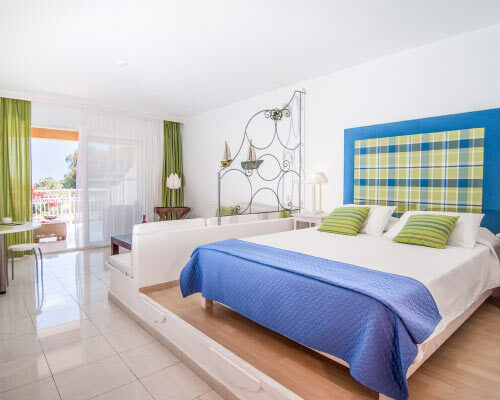 The apartments feature a separate bedroom with a double bed and a living room with a double sofa bed which can accommodate up to 2 adults and 3 children. 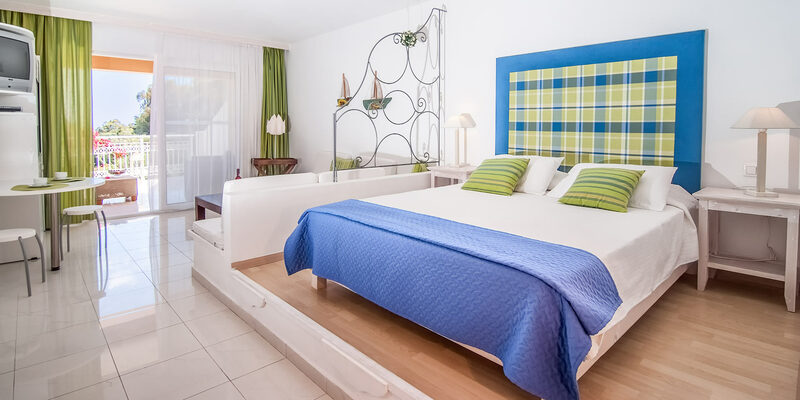 The double room consists of a double bed and a balcony with outdoor seating offering great views of Gerakas Beach. It can accommodate up to 2 people. 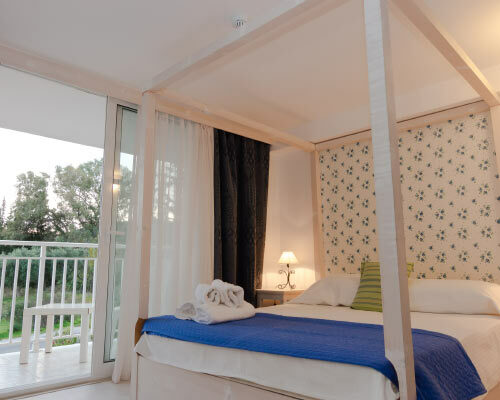 The double room consists of a double bed and a balcony or terrace with outdoor seating. It can accommodate up to 2 people. 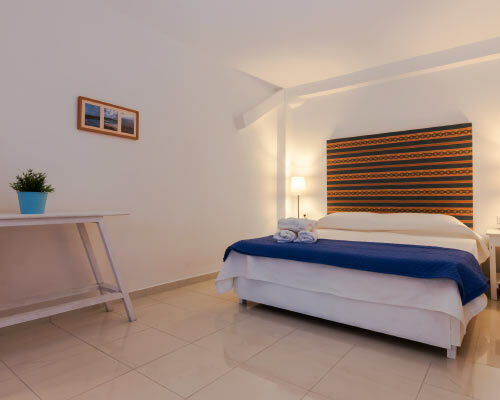 The Superior double room is a new addition to the hotel. It consists of a double bed and a open bed chair. It can accommodate up to 3 people. If you wish to unwind after a tiring yet adventurous day, follow the stone path on the back side of the hotel, through the olive trees that will lead you to the Villa Rossa Wine Bar. 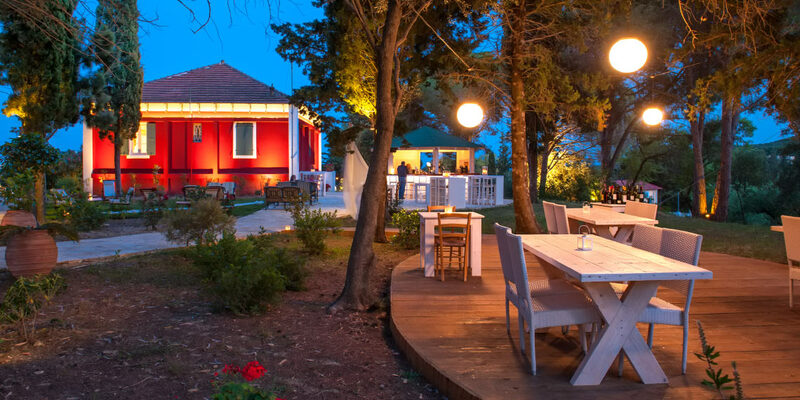 It is an old Zakynthian manor belonging to the Roma family that has been restored and refurbished with wooden floors, antique furniture and traditional embroideries giving you a taste of old Zakynthos. 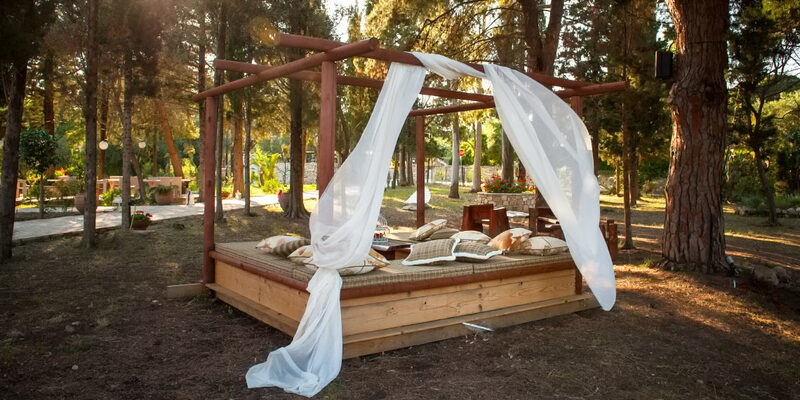 The manor is located in a Cypress tree grove and surrounded by aromatic flowers. Tables and chairs are spread out across the area under the star lit sky offering privacy while the discrete lighting combined with interesting jazz and lounge music gives the place an air of romance, serenity and relaxation. You can choose from over 40 different varieties of wine and numerous innovative cocktails prepared for you on the spot. Nothing is too much trouble for us in order to satisfy your taste buds. We also serve finger food and light meals to accompany your drink. You can finish off your dinner with a desert that will make your mouth water. What more can you really ask of an evening? The Villa Rossa Wine Bar is also available for events and happenings like parties, weddings, gatherings, etc. We will arrange and organize everything for you and see to it that all goes smoothly while you enjoy the evening worry-free. 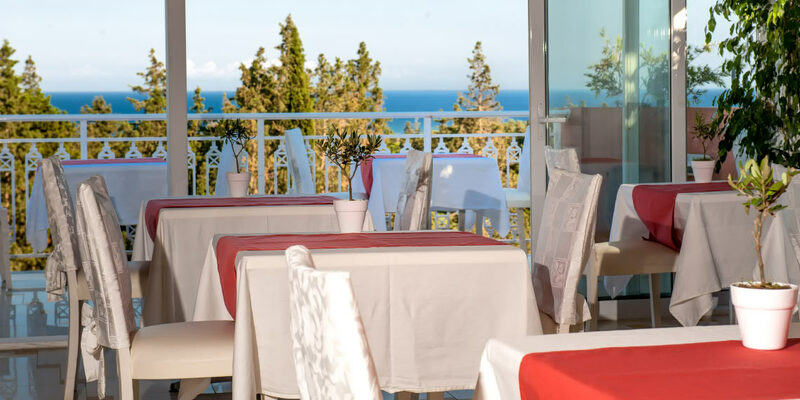 It is a unique experience to enjoy a delicious Mediterranean meal overlooking the colours of the sunset reflecting on the Gerakas beach rocks and changing every minute or being dazzled by the magical feeling you get when witnessing the moon rising out of the sea. It seems so close you can almost touch it. Breakfast and Dinner are served. 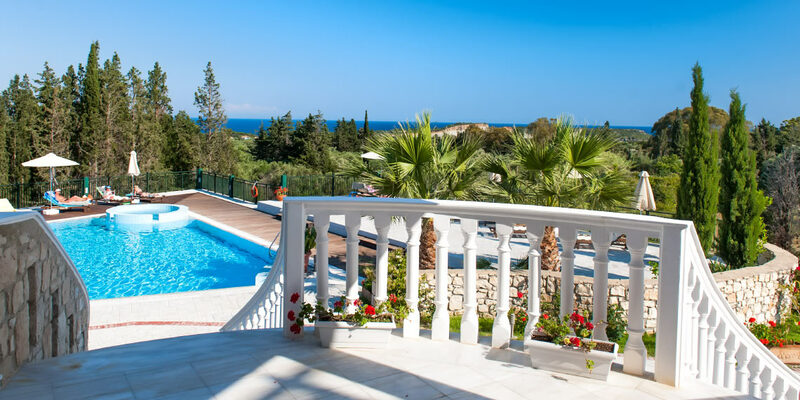 The tranquil atmosphere of the pool bar area is ideal for relaxing, reading or just soaking in the hot sun while enjoying the lovely view of the cypress trees and the different shades of green unfolding down the hill towards the sea. Light meals, coffee and beverages are served throughout the day. Our new and experienced chef and his team will excite your taste buds with creative Mediterrannean dishes. The Belvedere Hotel offers a wide selection of beautiful surroundings that are ideal for a wedding. Celebrate your special day at the hotel and the memories will follow you forever. Your dream island wedding can come true and you will have gorgeous photos against the blue colours of the sea, the orange shades of the sunset or the serene colours of the moon over the water to remind you of that perfect day. 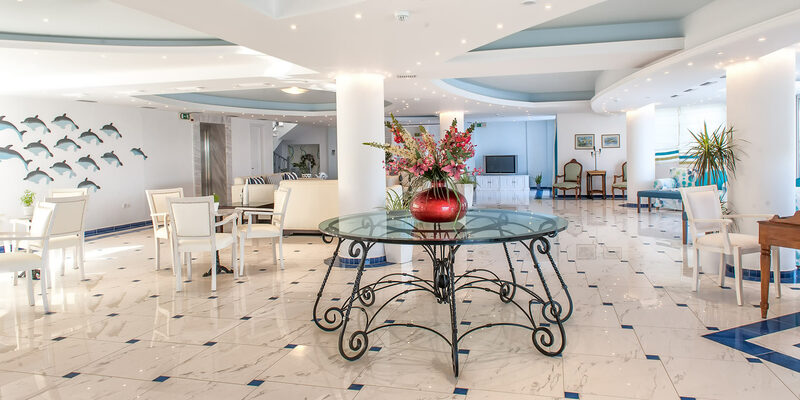 Hotel Belvedere is located only 700 metres away from the gorgeous beaches of Gerakas and Porto Roma. Gerakas beach is one of the beaches where the Caretta Caretta turtles lay their eggs. 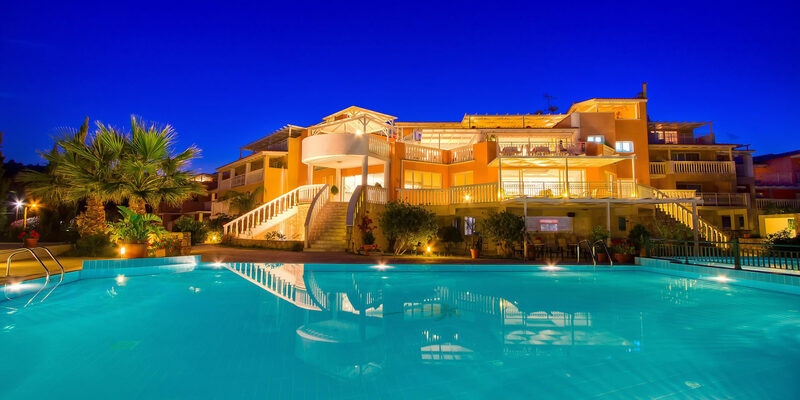 Vassilikos centre is only 200 meters away, meaning that amenities such as mini markets and tavernas are only a short distance away.